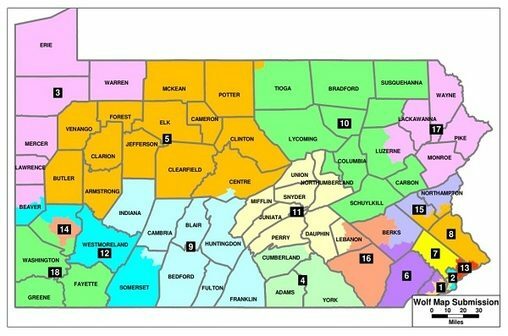 HARRISBURG, PA (WSKG) — A monthlong debacle over redrawing Pennsylvania’s unconstitutional congressional maps is coming to an end. Today is the deadline the state Supreme Court gave itself to either pick new maps from a number of submissions, or draw its own. But, state Republican leaders think the court’s own actions are unconstitutional and say they don’t plan to accept new maps lying down. Last month, Pennsylvania’s Democratic-majority Supreme Court declared the state’s 2011 congressional map an unconstitutional partisan gerrymander favoring Republicans. Justices made a controversial call for lawmakers to redraw it in time for the 2018 election. That meant the GOP-controlled General Assembly had three weeks to agree on new district lines, and Democratic Governor Tom Wolf had six days to review and approve them. Republicans immediately called the deadline unworkable. And as Senate Appropriations Chair Pat Browne noted at the time, it didn’t help that the court announced its ruling, then waited until two days before the legislature’s deadline to give specific requirements.